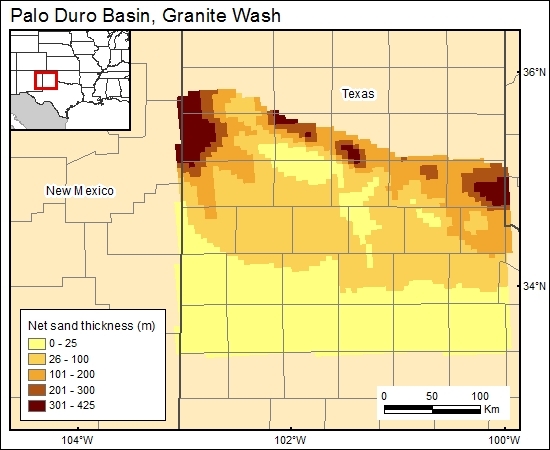 The data used to define the net-sandstone map for the Granite Wash consist of all clastic sediments that are sand size or greater (Dutton, 1980), including granite fragments and feldspar grains derived from the granitic uplifts that define the basin margins (for example, the Amarillo Uplift). This is actually a net-isolith map. The sand isolith was gridded (c4granitewash). Dutton, S. P., 1980, Depositional systems and hydrocarbon resource potential of the Pennsylvanian System, Palo Duro and Dalhart Basins, Texas Panhandle: The University of Texas at Austin, Bureau of Economic Geology, Geological Circular 80-8, 49 p.